Thanks so much for the great response to this blog! A special thank you to those who have passed it on to others. We are heading quickly to amazing page visits to this blog! Welcome to folks from all over the country and other countries as well, including Lisbon!! The "Village", as it was called, is located in the northwest corner of the city of Taunton, Massachusetts U.S.A. It covers about 1 square mile with the center being School Street. A large portion of the Village population was Portuguese when I was growing up. This blog covers a lot of the history of the Village, much to do with my years as a child there: 1940 through the late 1950's. I do have many wonderful photos and information prior to that that and will share those as well. Always looking for MORE PHOTOS AND MORE STORIES TO TELL. feel free to comment on the posts. Directions are on the right side of the blog posts. Jump in, the water is fine and it is easy!!! I will be posting photographs but not identifying individuals unless I have permission or they are a matter of public record. It you wish to give me permission, please let me know. Please note: the way blogs work is that the latest post is first. It you would like to start from the beginning of the blog, check out the post labels on the right of the blog and go from there. Thanks. 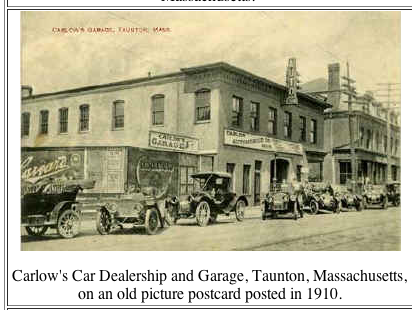 The 1910 postcard is of a garage in Taunton at that time. One notices that cars are replacing the horse and buggy seen in a previous photo. My grandfather, Joseph Souza, did have a horse and wagon for his wood cutting business in the early to mid-1900's. 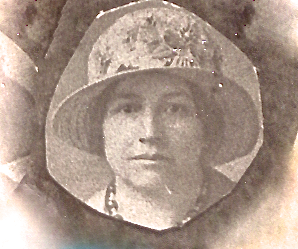 Prior to that he and my maternal grandfather, Manuel Mota, both worked at a brick works somewhere on Longmeadow Road. Did you know there was one there? I learned this in the City Books at the Historical Society. I could not find any photos or more information of that factory, except that I am told one can still dig up old bricks in that vicinity. They shopped their little neighborhood stores and bought from local vendors. TELLING A NEW TALE OF CAMP MILES STANDISH ! LOOK WHO HAS WRITTEN A LEGACY DOCUMENT? THIS WEEK CLUSTERMAP, THE APP SHOWING WHERE VISITORS COME FROM, HIGHLIGHTED US BLOG OF THE WEEK! Welcome to folks from all over the world!!! Change: due to the increased number of inappropriate and anonymous comments I have had to start reviewing comments before they are published. I will do this as soon as I can. You may not, therefore, see your comment right away but it will appear soon after. Thanks and please do continue commenting. This blog hopes to be a conversation and your input is so important to its progress. It keeps me going! WANT TO BE NOTIFIED WHEN THERE IS A NEW POST? Just subscribe at Follow by email on the side of the blog, put in your email address and you will automatically get the new post by email. Nifty and easy. Arlene Rose Gouveia is a major contributor to this blog. I wish to acknowledge her generosity in sharing her Memoirs and constant support with information, photographs and research. Thank you Arlene. at the edge of our thoughts: winking, tossing memories at our feet." IF YOU ENJOY THIS BLOG PLEASE HELP TO SEND IT ON AND SHARE IT AND LIKE IT! Commenting on any of the posts is easy. It really helps me when folks comment as it lets me know how the blog is doing. Anyone can comment easily on the posts. If you would like to send me photos or just chat, you can do that at spinoart@comcast.net. Here are a few of the posts in this blog...to whet your interest or for a quick look.... still working on this. "He who does not know where he came from does not know where he is going." There is much history in this blog which has been written over four years but was decades in the making as this little neighborhood, a village really, made its way through its lives, loves and times. I hope you enjoy it and urge you to comment and follow it.Every time I think I have reached the end, more memories come forth. A Village WW II love story.